Contact Anna to discuss your design and get a personal price quote before you buy! Use the pull-down menus below to estimate your price to have your screen painted. If you are in the Baltimore area you may schedule a drop off time to my home studio near BWI Airport. I will provide directions when you schedule. It is important and it is the customer's responsibility to properly mark the TOP OUTSIDE of your screen with tape when you are removing it from your window so I will know the correct orientation to paint your screen. It is not always obvious which is the top and the inside. I am not responsible for improperly oriented screens. I am now taking orders for 2019. First come, first serve! I generally paint customer screens in the order I receive them. Please allow 4 to 5 weeks for completion from the time I receive your screen. 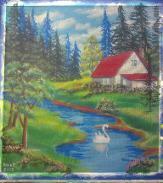 Visit my original website for comprehensive information and tips on How to Order your screen painting. Pay for custom screen paintings and purchase gift certificates for a very unique and personal gift online via PayPal. Cash and personal checks are accepted in person. Credit card payments are accepted on-line only. You can buy also buy prints of my screen paintings at Artist Rising.com. Use the pull-down menus below to estimate the price to have your screen painted. 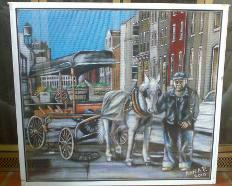 Traditional scenes painted on your window screen. Get a price quote from Anna before selecting your window size and price. Your personalized design painted on your window screen. Ask Anna to guide you to the best pricing before you pay. Ask Anna about special pricing for services such as custom interior screen art and re-screening your tattered window screens. 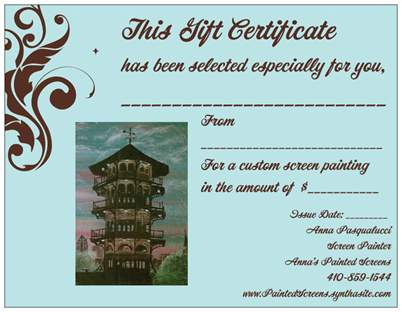 Give the gift of an original one-of-a-kind Baltimore window screen painting to your special someone. The gift recipient will receive a free design consultation with the artist, either by phone, online, or in person, to have their window screen painted with an personalized design of their choice. Email Anna for your custom gift cost estimate at AnnaPasqualucci@gmail.com. I apologize that PayPal has made changes and has discontinued the "Buy Gift Certificate" option. If you are experiencing problems with online ordering, please email Anna to request a gift certificate be mailed to you.